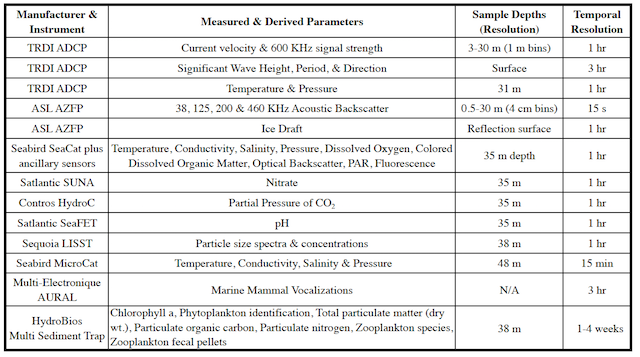 Advances in instrument technology now allow us to autonomously sample the marine ecosystem from the vantage of multiple disciplines and across multiple trophic levels. With support from the Alaska Ocean Observing System, the North Pacific Research Board, Olgoonik-Fairweather, the University Washington, Université Laval, and the University of Alaska Fairbanks, we annually recover and re-deploy a set of subsurface moorings on the NE Chukchi Sea continental shelf. The instruments record with high temporal resolution throughout the year, including the under-sampled and poorly understood seasons when sea ice typically inhibits ship-based sampling. 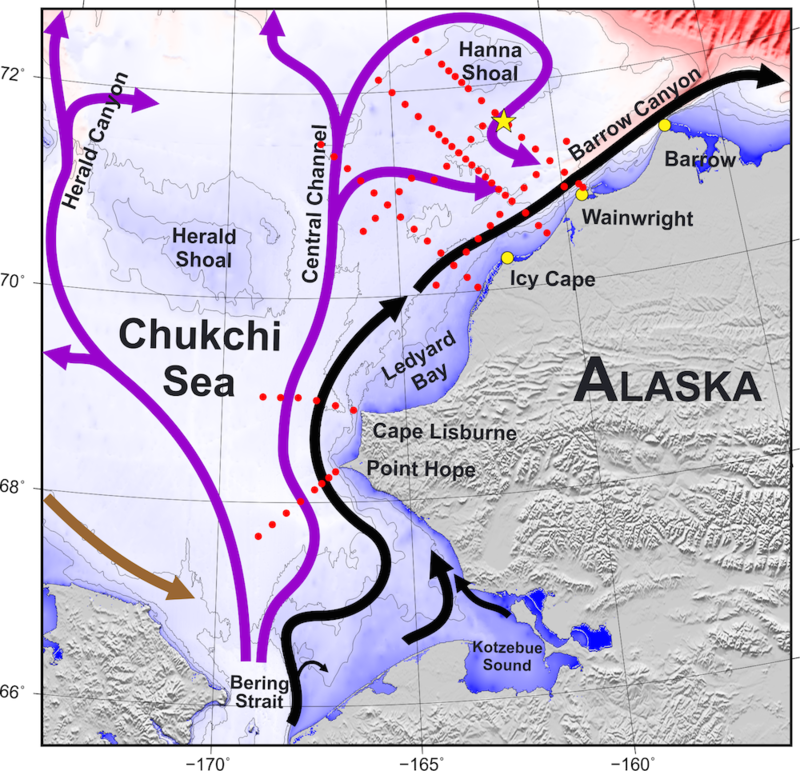 The mooring records physical, nutrient and carbonate chemistry, particulate, phytoplankton, zooplankton, and fisheries data sets, thereby providing an unprecedented view into the mechanistic workings of the Chukchi shelf ecosystem. This highly instrumented mooring’s payload is unique for the Chukchi and Alaskan Beaufort seas, and rare for any continental shelf. Mooring operations with annual summer turn-arounds are funded through 2019. The mooring is deployed at 71.6°N, 161.5°W on the northeast Chukchi shelf on the south flank of Hanna Shoal and northwest of Barrow Canyon. This is a biological "hotspot" with high benthic biomass and large numbers of walrus that feed in the region during summer months. The mooring site is marked with a yellow star on the AMBON 2015 station map. Deployment is carried out in partnership with other field programs. The 2015 deployment and recovery was accomplished in partnership with the Arctic Marine Biodiversity Observing Network (AMBON) 2015 survey.